Mobile stage rentals are a relatively new product on the staging market. A mobile stage works great for festivals requiring street closures or tight timelines. For one day events, they are typically about the same cost – or sometimes a little less expensive – than a load bearing stage and rooftop. However, for multi-day events, they can be significantly more pricey. A mobile stage rental is pulled using either a heavy duty pickup or a tractor depending on the size of mobile stage. For this reason, mobile stages cannot be used on sensitive surfaces, such as football stadiums, baseball diamonds and City parks. They also will not work on areas with a significant grade. The biggest advantage with a mobile stage is time of setup. They typically take about 4 -8 hours to setup, where a modular stage and roof system can take up to a day and a half. A mobile stage can also be easier to get permitted in major metropolitan areas. Mobile Stage Rentals and In Depth Events! One of our favorite mobile stages is our MAP 24. This 24’x16′ mobile stage works perfectly for house of worship events, small festivals and community events like grocery store openings and municipal events. You can see other pictures of Mobile Stages in use in our gallery. Of course, we also use StageLine Mobile stages for our clients. We can provide the SL100, the SL260, the SL320 and, of course, the SAM555 mobile stage. These stages are used all over the world for their ease of use, dependability and professional look. Like anything else, using a mobile stage has advantages and disadvantages. 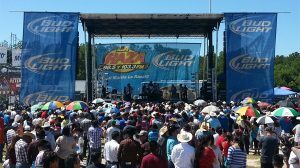 The important thing to remember is to find a stage vendor that is experienced with using mobile stages, load bearing stages as well as the technologies used for live event production. Luckily, the experts at In Depth Events have you covered! Ask Us a Question for more information on mobile stage rentals, or our full live-event production services for your next concert, festival or corporate event!